The organizers of the 1st International Peace Film Festival in Gangjeong (IPFFIG) wish to notify all those concerned that we have been given no choice but to relocate the screenings that had been scheduled to take place at Seogwipo Arts Center. Although it had been one of our main venues planned for the festival, the Arts Center has abruptly withdrawn permission to use its space, and it thus canceled an existing agreement negotiated with IPFFIG representatives several months earlier. This was a hastily announced decision by the Arts Center that we believe is deeply unjust and unprofessional. We will seek legal redress for this unacceptable situation, but in the meantime we have resolved to ensure that all selected festival films will be screened instead in Gangjeong Village. Regarding the context of this controversy, Seogwipo Arts Center is a public space for culture and art in Seogwipo City, which is run by the local government and supported by our taxes. Since last December, we have been in close contact with Seogwipo Arts Center, and we completed all the necessary steps in the application process to arrange for screenings to take place at that venue for the duration of the festival. More recently, we were contacted by officials at the Seogwipo Arts Center with unreasonable requests that were evidently an attempt to vet our selection of films, a form of censorship which we resisted. While we were busy preparing for our official press conference that would be held in Seoul on April 6th, the Arts Center officials hounded us with requests to receive our list of the films. Eventually, we were required to send them that information by March 20th, after which point the officials pressured us further, asking for a detailed description of each film. Even though we were concerned that they were attempting to limit freedom of expression, we submitted the descriptions of the films, hoping for the best result. We waited for their response, but we did not receive a clear answer from the venue. 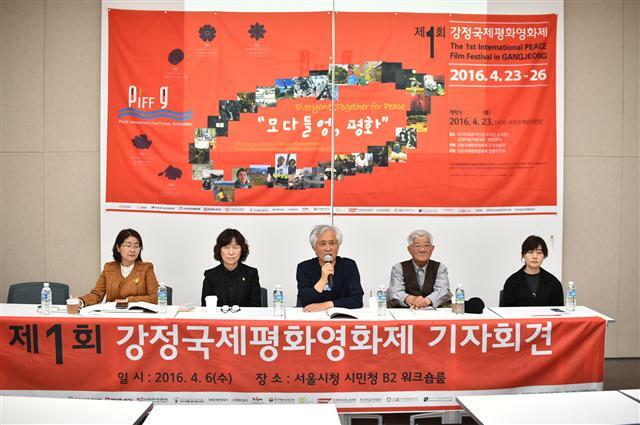 On April 5th, the day before our press conference, a member of IPFFIG’s Program Committee finally heard from an Arts Center official, who explained that the reason for the delay in their decision was because the program included a few films which criticize the government’s policies and also because the mention of Gangjeong Village in the event’s name is itself political in character. We were appalled by this unfair pressure from the government and made this issue official by notifying the press about this development. 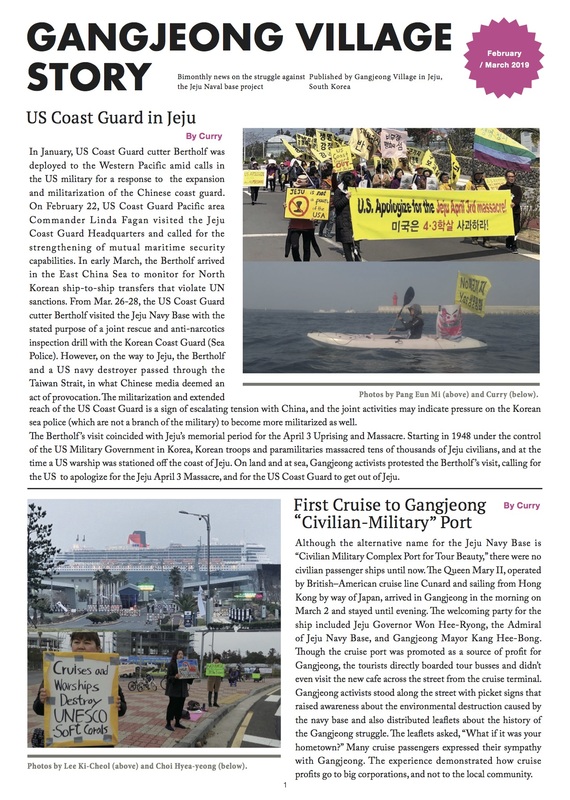 It became national news and has been regarded as part of the Korean government’s ongoing repression of the cultural scene in the same way that organizers of the Busan International Film Festival have been embroiled in a censorship controversy involving the Busan local government since last year. Despite the public pressure in support of IPPFIG, Seogwipo Arts Center notified us on April 12th with their final decision to withdraw permission to use its space. The International Peace Film Festival in Gangjeong denounces such censorship of the arts and the unjust violation of the right to freedom of expression. Accordingly, we are preparing to take legal measures, including a petition for a provisional injunction that would require the Seogwipo Arts Center to take responsibility for all the damages it inflicted upon us in this process. We believe that gathering to watch films means engaging with urgent social issues and allowing free expression of thought and opinion in response to our shared social and cultural milieu. The International Peace Film Festival in Gangjeong is an event for those who love film, appreciate culture, and think seriously about the challenges facing our society. We seek to embrace the social suffering of Gangjeong Village and Jeju Island and, through an engagement with provocative films, to open a space for experiencing emotions and conversations about social conflict and also about possibilities for the future. Therefore, we are profoundly honored to hold this film festival in Gangjeong Village, as we do our utmost to establish it as an enriching cultural event for Jeju people who yearn for peace. The Village Association concludes that the Seogwipo Arts Center failed to honor its commitment to IPFFIG and went against a signed agreement because of a biased political judgment that discriminates against them, which violates the spirit and mission of the Arts Center as a public venue intended for use by citizens.